Whether you are a renter or an owner, the fear is there. Is your wall about to pour ice water into your living space? Where do you look for leaks? Which icicles are a problem? Theory: Water is, literally, mindless. All it wants to do is get to earth. Water will go down by the easiest route possible. Normal water flow: When water is liquid, it comes off the roof, into the gutters, and down the downspouts into puddles or into the soil. Ice: When water gets frozen, it can’t get to the downspout, so it collects in the gutter. Then, you will see icicles. Not all icicles will be a problem. Unless they get so heavy that they pull your gutters down, they don’t hurt the house. As long as they are not dangling over walkways or driveways, they won’t hurt people or cars. Problem ice: Melting ice will seek the quickest route earthward. Melting ice will head earthward through small cracks in the wood behind the gutter. This water may find its way into the empty space between your outside wall and your interior wall. Then it will flow down the upright wood that holds your walls up until it reaches a horizontal piece of wood. There it will puddle. The water will seep through the wood. Then it will drip through the wood into your house. If the easiest route for the ice is to go under your roof shingles, you’ll get a roof leak. An ice shield should prevent this type of leak. If you have no ice shield, the water may find its way in. Ice behind the gutters. In the picture above, you can see that water has found its way behind the gutter, dripped down the roof rafter, and dripped down the side of the house. If this water found a way behind the vinyl siding at the soffit, there could be a leak in the house. In this case, I would advise the resident to watch the ceiling on this outside wall for leaks. Notice how the ice is collecting on each horizontal surface all the way down. I would advise the resident to watch the window wells for leaks on any of these windows. 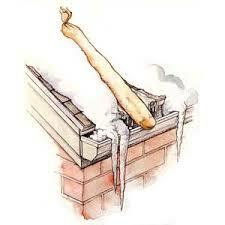 Ice under roof shingles: if there is no ice shield, ice will melt into the house on the edge. Either it will drip through the soffit outside the house, if you are lucky, or it will find its way into your ceiling. Watch the ceiling on this outside wall for leaks. Outside, it will look like the picture above or, if you have an open soffit, it will look like this. Bang on any downspouts you can reach safely through a window. This opens the best route for the water to take to earth. If your roof is accessible safely, thick ice can be chopped. Most people leave this job to a professional due to risk of falls and risk of damaging your roof. Consider doing a controlled melting using chemical ice melt (calcium chloride) in a sock or stocking. This is being called the “This Old House” trick. If you can get to the ice build-up safely, it is a good idea. If you have icicles you can’t reach, watch the ceilings and window wells under the icicles. If you have a leak, use water absorbent material to mitigate damage. If you have a leak, make a hole in the wood or plaster where water is dripping. This will coax the water to enter at a place where you can put a bucket. If there is a large amount of ice that you cannot get to, seek professional help when leaking starts.